Preheat oven to 230 Celsius or 440 Fahrenheit. Line and grease a 10″ x 12″ rectangle pan. Some of you may have already known, that I had a health scare recently and was motivated to start juicing for life and losing some weight. Well, the weight has not come off yet, I am still reluctant to give carbs altogether, but have given up on some sugar and most salt. There is a bottle of soy sauce that I still keep hidden in the house for sushi days and stuff. Now I can't stop bragging enough about my Hurom 400, it's wonderful! I love it! It has made me consumed more raw vegetables and fruits juices in my lifetime. I love them, I am so addicted to beetroot juice but I have to stop at, just once a week. So in the between days, I drink other types of juices and hence my need for recipes. So, I started getting interested in the juice recipe books. I bought two books recently from Book Depository in the UK. I love that their books are so much cheaper to buy than anywhere else online, and they have free shipping worldwide. It's genius! I bet they dominate the global market with this clever idea. My review on this two books, well, it's not really a review, more of a personal opinion of my purchases. The Jason Vale book is more for motivation and it's a program, whilst explaining about how your body works and why, which can be helpful. It includes only a handful of recipe which I find to be little disappointing. I actually like the second book I bought, Sandra Cabot's, which details health problems and follows up with a recipe to use for each of the problem. 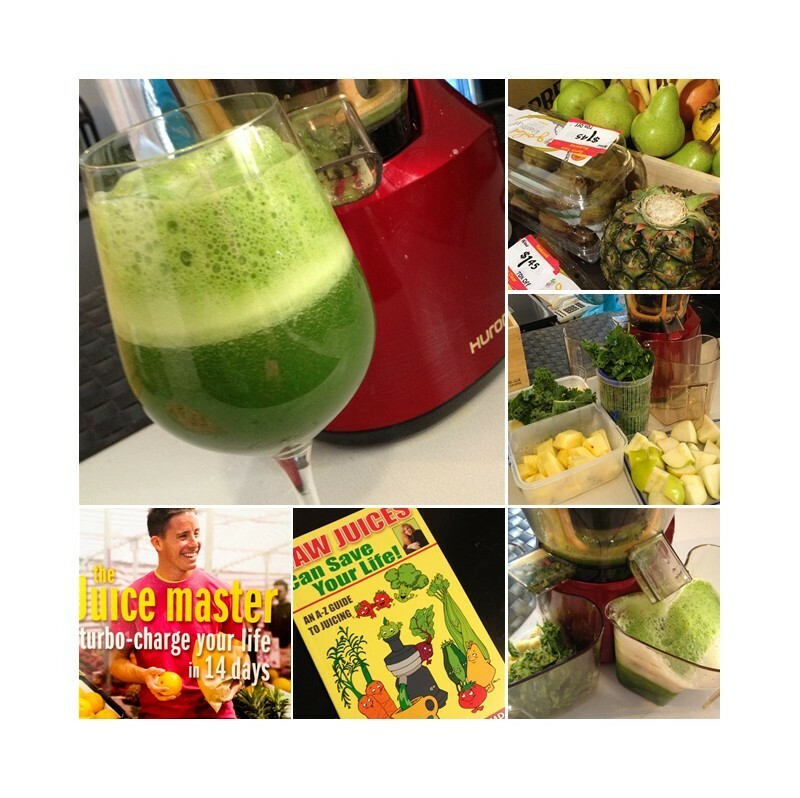 I am sure the Juice Master is good too, for all the motivation parts for the 14 day program but I still prefer recipes at this stage. So I am happy with this purchase. I recommend getting these books if you are interested in juicing. This morning's green drink recipe which I threw together, because that's what I have on my juice bench : ) I forgot to put in my golden kiwis. But after juicing I figured that I have had enough fruits to sweeten my veg drink anyway. This morning I am following Popeye! Green apple, pear, pineapple, kale and spinach.